KUALA LUMPUR, 28 Feb 2014 – Student activities are not merely planned to give them co-curriculum credits but mainly to build their characters, self-confidence and soft-skills. Such skills are important to enable them to compete in the market place once they graduated, said Deputy Vice Chancellor (Student and Alumni Affairs), Prof Datin Noor Aziah Mohd Awal at the Tun Dr. Ismail Residential College (KTDI) of The National University of Malaysia (UKM) annual dinner here recently. She congratulated students of the college which houses only medical students for being able to organise the function on their own and at a grand hotel. Organising such an event would have given them the experience which they could not get during their classes but will teach them about team work, punctuality, time- management, money management, strategic planning and communications. Prof Noor Aziah said such skills are important to enable them to compete at the national and international level after graduating. Employers now no longer look at academic achievements alone when hiring new employees, she said. She reminded them to uphold the good name of UKM wherever they may serve. 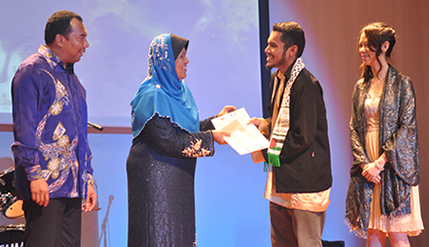 Prof Noor Aziah later presented various Student Achievement Awards with the accolade being the Tun Dr. Ismail Award, where each year a senior student is singled out for his outstanding academic achievement, extra-curricular activities and contributions to the college or university or society. College Principal Prof Dr Zulkifli bin Md Zainuddin was also present.